That’s the date that South Africa held its first democratic election, forming a multi-racial coalition government and officially doing away with the country’s brutal, five-decade long system of racial segregation and oppression. Nelson Mandela was president and apartheid had been brought to an end. However, the “Rainbow Nation” had a new challenge to confront — one that, 20 years later, it has not adequately addressed: HIV/AIDS. Mission teams from the South Africa Ministry Network spent a week in July working at the Thembelethu Care Organization, a Christian ministry in the rural Winterton area responding to the effects of the HIV/AIDS epidemic through free medical care and programs fro orphans and vulnerable children. During the early 1990s, the prevalence of HIV/AIDS began to increase rapidly. Yet, the South African government failed to put in place a coherent strategy throughout its provinces. In the face of government inaction and a climate of conspiracy theories and denialism, thousands of South Africans were dead and dying. As the epidemic worsened in the late 1990s, an English woman named Sofi and her husband, Robert were going into the South African villages along the foothills of the Drakensburg Mountains, bringing food to AIDS patients who were dying in their homes. They did so at a time when there were no medicines, no antiretroviral regimens available. Sofi and Robert received no payment as they fed and bathed the suffering, helping them to be as comfortable as possible in their final days. Robert later became sick and passed away, but Sofi stayed, and continued the work. She went door to door throughout the rural Winterton area, assisting those in need with health support and information about finances and government services. And many were and still are in great need in Winteron and the surrounding area located in the KwaZulu-Natal province — the country’s second largest and poorest province which carries the distinction of having the highest HIV/AIDS rate. An estimated 1.6 million people live with HIV there, just over 37 percent of the population. In 2009, Sofi started a permanent community center called Isibani, which means “bring the light” in Zulu. The center offers many much-needed services, including home-based health care, HIV testing and counseling, food and clothing distribution, child and youth projects, adult literacy classes and emergency assistance. 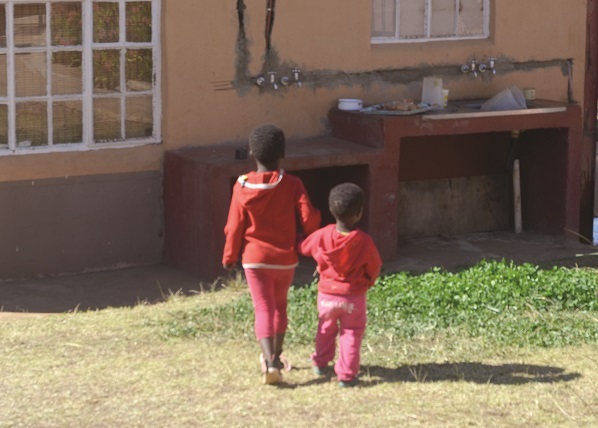 Three years later, Sofi launched Isiphephelo (“refuge” in Zulu) which provides a safe and temporary home to vulnerable, neglected and abandoned children. Over the years, Sofi has seen much death and knows the many faces of despair. She finds herself frustrated often, weary of a broken system that tends to fail the children it is supposed to protect and keep safe. “The culture is just in such a meltdown,” said Sofi, noting the growing use of drugs among the region’s teens. Yet, she perseveres. She continues to be present, serving those with HIV/AIDS and showing a big smile when she’s around the children of Isiphephelo. 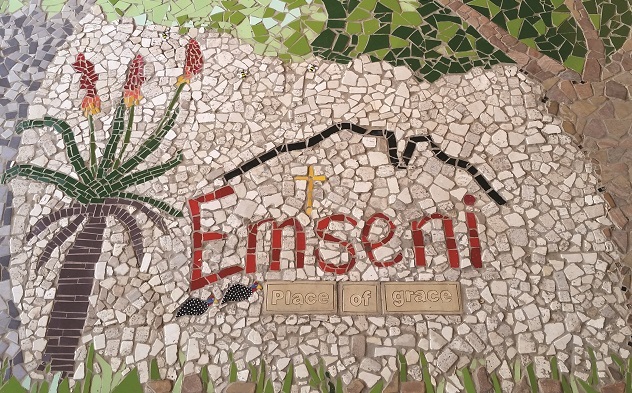 During the week-long mission experience, the network hosted a retreat at the Em’seni Camp (“place of grace” in Zulu) for the staff and children of Isiphephelo, an organization which provides a home to neglected and abandoned children. At the Em’seni Camp (“place of grace” in Zulu) outside of Winterton, surrounded by battlefields where the British fought the Boers and Zulus in a series of bloody wars more than 100 years ago, the network hosted a retreat for Sofi and the children and staff of Isiphephelo. While some played with the kids, others spent time with the staff, leading the group of smiling and singing women in team-building activities, Bible study and providing space for reflection and relaxation. Network participants also worked alongside the staff of the Thembalethu Care Organization, a Christian ministry responding to the effects of the HIV/AIDS epidemic and the extreme poverty in the region. Thembalethu shares God’s love through caring for the sick in the rural villages as well as orphans and vulnerable children. Started in 2006 and run by Betsy Meyer, a field personnel from Seattle’s University Presbyterian Church, Thembalethu — a partner with the U.S President’s Emergency Plan for AIDS Relief (PEPFAR) — provides medical care to 300 patients each month and regularly cares for more than 120 children with psycho-social support, food parcels, access to social welfare grants and school grants. Meyer emphasized that the younger generation living in the area, where nearly 80 percent of residents are unemployed, faces intractable challenges. “Even if [youth] go and finish high school, or go to university, there are just so few options for them,” she said. “So, it’s really a struggle. That’s the most significant challenge youth around here face — there’s this kind of hopelessness because they don’t really have options. The impact the HIV/AIDS epidemic has had on the region cannot be understated, said Sara Williams, who alongside her husband, Mark, served as CBF field personnel in Winterton from 2010-2014. 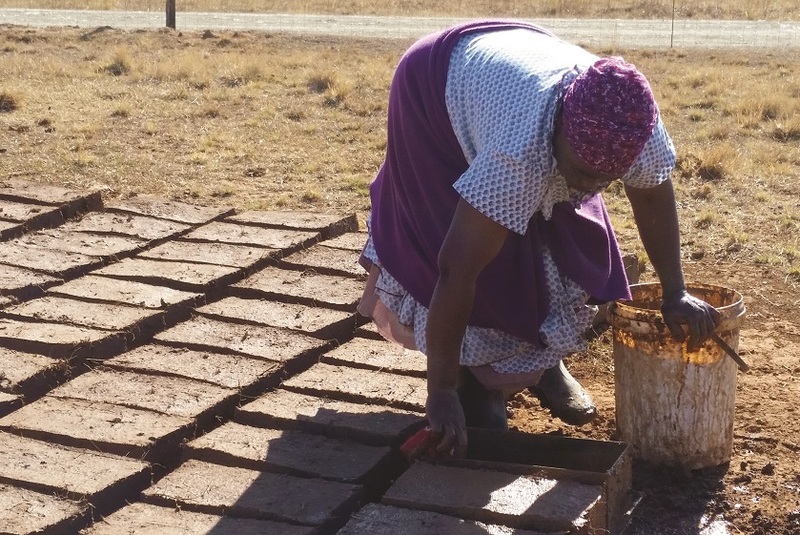 A woman makes bricks for a tuck shop, a small store where she can sell essential items to her neighbors, in a rural village in the Drakensberg Mountains just outside of Winterton, South Africa. Villagers face extreme poverty and reside in the country’s poorest province, where more than one-third of the residents live with HIV. “The HIV/AIDS epidemic and extreme poverty have wreaked havoc on society at large,” said Williams, who accompanied the network on the July mission experience. A recent study found that just over one in 10 South Africans are living with HIV. That’s 6.19 million in a nation of 55 million people. According to PEPFAR, 200,000 deaths were due to AIDS in 2014 and the number of new infections last year reached 370,000 — seven times the number of infections as in the United States, a country with six times the population of South Africa. Condom use is dropping and the infection rates of teenage girls are alarming per a new survey. The estimated antiretroviral coverage over those with HIV over the age of 15 is just 42 percent, and the number of orphans due to AIDS (ages 0-17) was 2.4 million in 2013. Despite these grim realities, Williams and the network’s leaders see God at work in the Winterton area. Network leaders have asked Cooperative Baptists and friends of the Fellowship to pray for the work God is doing in South Africa. “Please pray for Betsy and the staff at Thembalethu, as they seek to care for the needs of those in the extreme rural areas outside of Winterton,” Williams added. “Pray for Isibani, Isipophelo and Sofi as they seek to be neighbors to those that are outcasts and live on the margins. Pray for their spiritual wellbeing and pray for their safety as they put themselves at risk daily for those lost and in need. 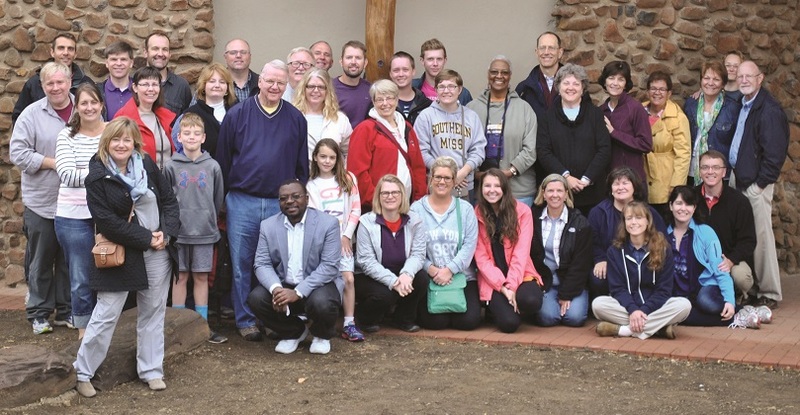 The South Africa Ministry Netwrok led a group of 70-plus Baptists on a week-long mission experience to ministry sites in the capital city of Johannesburg as well as the rural Winterton area. The Winterton group included members from the following netwrok congregations: Frist Baptist Church, Chattanooga, Tenn.; Second Baptist Church, Memphis, Tenn.; First baptist Church, Wilmington, N.C.; and Gaston Oaks Baptist Church in Dallas.